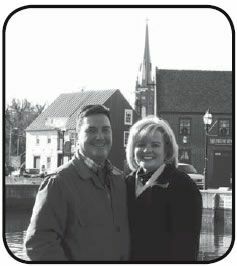 Patrice and Eammon McGeady in historic Annapolis with St. Mary's steeple in the background. The gift of a Catholic education is one that continues to give its recipients a moral foundation for many years after we leave the classroom. Many of us were blessed to attend a parochial school, whether it was St. Mary's or another school. Our parents made the choice and the accompanying sacrifices so that we could learn and grow in our faith. One couple, Eamonn and Patrice McGeady, inspired by the example of their own parents' choice of Catholic schools and their own love of St. Mary's School in particular, decided to make the dream of a Catholic education possible for other students by creating The McGeady Family Endowed Scholarship Fund in 2004. This scholarship awards one outstanding St. Mary's Elementary School graduate a four-year, $1,000 annual scholarship to St. Mary's High School. Patrice McGeady's family, the Perrys, moved to Annapolis when Patrice was 10 years old. She started at St. Mary's Elementary School right away. Because of space limitations, however, her parents were unable to get her other siblings into the school. Eventually, all four Perry children would graduate from the high school. Her parents, who just celebrated their 57th wedding anniversary, became active parishioners at St. Mary's Church. Her father is still very involved and has run the St. Vincent de Paul Giving Basket Program for about 10 years. Patrice, in keeping with her family's tradition, continued her education at Loyola University (formerly Loyola College) in Baltimore. While his future wife was attending St. Mary's School in Annapolis, Eamonn was attending Mount Washington Country School (a Catholic military elementary school), then matriculating to Calvert Hall. He grew up with a strong connection to the Annapolis area and many fond childhood memories of sailing and spending time on the water at his family's place on Round Bay in Severna Park. A weekend at Sherwood Forest in 1975 led to a blind date with Patrice, and the couple stayed friends throughout college, with Eamonn graduating from McDaniel College in 1980 and being immediately commissioned as an offi cer in the Army. When the couple married in 1984, it was natural that they would choose St. Mary's as the site of their wedding. The young couple went directly to Germany with the Army and their son, Manus, was born just after returning to the Annapolis area in 1989. Upon their return, the family "tried other parishes" before concluding that St. Mary's "was a good fit, and it felt like home!" Eamonn became a lector and also has served on the Pastoral Council, School Board, and various parish and school committees [beginning during Father Murray's last year and serving until Father Kingsbury arrived]. During his time, he served jointly on the council and the school board and worked on the restructuring of the school board. In 2001, he was part of the team that was tasked with searching for not one principal, but two—simultaneously searching for leaders in both the elementary school and the high school. He vividly remembers working with the great search team that included Mary Ann Gordon, Mollie MacAdams, Sister Elise Mary Saydah, SSND, Marcia Verploegen, Ray Crosby, John Lamon, and Margaret Crabtree on this challenging task. Patrice has played an active role recently as a member of the revitalized Alumni Association Board of Directors. Her St. Mary's friends have been her friends for life, and she believes that the association gives alumni a mechanism to get involved and to reconnect. Why did the McGeadys establish their endowed scholarship? When asked why they established their scholarship, the McGeadys spoke about the infl uence of two fathers. They credit Father Denis Sweeney with "really motivating us to get involved and think about giving." They also cite Eamonn's father's death (he left behind a strong legacy of giving to the Archdiocese of Baltimore, especially the Cathedral of Mary Our Queen in Baltimore). Fr. Sweeney and Eamonn's father were the inspiration that provided the immediate impetus to encourage the McGeadys to leave a legacy, make a mark at St. Mary's and pay tribute to Eamonn's father. Their goal was to establish an endowment fund that would exist in perpetuity and provide approximately 5 percent of investment income each year to fund a portion of, if not the entire, scholarship amount. The McGeadys are among a handful of others who pioneered the start of an endowment for St. Mary's. When deciding on the focus of their endowment, it was a natural choice that they should choose to direct funds toward education. The couple decided they wanted to fi nd a way to bridge the divide that existed between elementary school students who were really excited to come to high school and those who wanted a change. The McGeady Family Scholarship was the mechanism they created to keep the best and the brightest in our parish high school. In announcing the scholarship to the community, the McGeadys described their inspiration in this way: "My dad's vigorous faith and leadership in the community was a lasting inspiration to everyone who knew him. He left his family with the knowledge that faith, integrity and commitment to parish and community are values that we should hold and foster in others. In his memory, the criteria for this scholarship is based on the student's overall scholastic excellence, including test scores, grades, classroom effort and conduct, demonstrated service to the parish/community and exemplary character." The McGeadys believe, like so many of us, that what makes St. Mary's great is the sense of community. Their vision for the future of the endowment is that more people will realize "what a gift they have, a gift that has come through the centuries, through the Redemptorists, we need to be stewards, we need to make sacrifices." In their words, St. Mary's will still be here for generations to come but now is the time to think about our duty to the parish and ask ourselves,"How are we passing along the St. Mary's legacy long-term?" They encourage other parishioners to ask themselves the following question: "How can we leave St. Mary's better than we found it?" One very important answer to that question is, "We can build the endowment so that we won't have to worry about things like heating costs, tuition, etc.—because they will be covered." 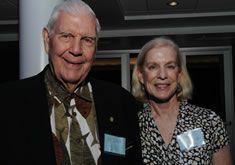 For more information about the McGeady Family Endowed Scholarship Fund, please visit www.stmarysannapolis.org. The McGeady Family Scholarship, an endowed fund, awards one St. Mary's elementary student a four-year, $1,000 annual scholarship to the high school. The recipient is selected by the donors or their designated representative from three finalists selected by the high school and elementary school principals and his/her appointed representatives. A fiGeanal decision will be based on the student's overall scholastic excellence, including test scores, grades, classroom effort and conduct, demonstrated service to the parish/community and exemplary character. Applicants must maintain a 3.5 average during their matriculation to St. Mary's High School. "After being the first recipient of the newly established McGeady Family Scholarship in 2004, it makes me proud to see the quality of candidates selected year after year for this award. The McGeady Family Scholarship has helped me realize the importance of both my academic endeavors as well as given structure to my extracurricular, athletic and social life throughout high school and college. I can't thank the McGeady Family enough for their continued support to help St. Mary's students' reach their goals." Who Is Commander Al Vittek? Commander Al Vittek has been a St. Mary's parishioner since 1959. All three of his children—at some time—attended the school. He remembers it in those days as "a small school with very strict nuns." He was born in northeast Baltimore in 1921. He is a second-generation American whose family came from Bavaria and Bohemia. He attended St. Michael's in Overlea and Kenwood High, both in Baltimore County. In 1937, when he turned 16, he enlisted in the Navy with his parents' approval and the agreement that he would finish high school first before being called. He was called to duty in 1938. After World War II, where he served in Algeria, Italy, England, France (including Normandy) and the Pacific, he made the Navy his career. This decision took him around the world to Korea, through five commands, to the Naval War College, and on a final tour at the U.S. Naval Academy (USNA), where he was the head of navigation instruction. He was promoted 12 times up to the level of commander. In the Navy, Commander Vittek spent a lot of time at sea while Mary raised the children. He was away so much that once when he left, after being home on leave, his youngest daughter thought he was a stranger who had taken the family's car. His military salary also made it hard to pay for three children in high school getting ready for college, so he left his naval career in 1960 to become the "first stockbroker in Annapolis" that year. It took Commander Al three years to establish a contact base to earn a living and support his family. When he took his first paycheck home, he was a bit discouraged. He showed the check to his wife and said, "We can eat it, drink it, or frame it." In the coming years, he succeeded in his new career. By 1999, after managing at Alex Brown for 30 years, he moved to RBC Dain Rauscher. He retired in the early years of this decade. What motivated him to begin giving? He began supporting St. Mary's in the early '90s when Father Tom Sigonolfi was pastor. Commander Vittek was the stockbroker for the church. Additionally, he saw a great need to provide financial support to families wishing to send their children to St. Mary's School. Commander Vittek became a pioneer member of the St. Mary's Legacy League by establishing an endowment to create income to support the tuition assistance program in perpetuity. How do you see giving to the endowment as different from giving to offertory or restoration and maintenance? "It offers the opportunity to designate how money can be used." Commander Vittek really wanted to see his endowment become tuition assistance directed toward students who value a Catholic education. What would you say to other parishioners who are considering an endowment gift? "People should take the time to explore the benefits of giving. Stock is so easy to give and get; you get to give the gift and get a tax benefit. Plus, by supporting St. Mary's, you can give without being subject to capital gains. It's a painless way to give." St. Mary's is deeply grateful to Commander Al Vittek. Students and families will benefit from his generosity for many years to come. A donation of stock, cash or property. A financial contribution that is invested to grow annual earnings which are used to support operations or specific projects initiatives of an organization. A set percentage of earnings drawn down annually, while the principal donation amount remains is intended to remain intact, to provide a perpetual source of revenue support. Step 4: Approx. $2,500 donation to organization in 2012, 2013, 2014, etc...to be used for operations, maintenance, tuition assistance, where needs are greatest (*Note- Endowed funds are subject to investment performance and policies set by parish leadership. Step 5: Regular reports sent to the donor annually with detailed fund performance and how assets were used. Act now to take the steps that you need to do to be a good steward of the resources you intend to leave behind. You can contact us below, or use our request for information form to get more information.